A British man has smashed the record for cycling round the world. 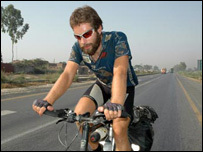 Mark Beaumont, from Fife, completed the journey in 195 days - beating the previous record of 276 days. The 25-year-old crossed the finish line at the Arc de Triomphe in Paris at 1430 GMT after an 18,000-mile journey which began on 5 August last year. Mr Beaumont passed through 20 countries on his way, including Pakistan, Malaysia, Australia, New Zealand and the US. His solo journey has been dramatic at times. He endured floods and road rage, and was knocked off his bike in the American state of Louisiana by an elderly motorist who drove through a red light. Mr Beaumont, who is originally from Bridge of Cally in Perthshire but now lives in Newburgh, also had his wallet and camera stolen from a motel. However, he is now celebrating. He said: "I'm delighted, although I think it will take a while for it to sink in. "It's great to see my friends and family and now I'm looking forward to getting some sleep. "The challenge was one of those things which was out there to be done. "I love the idea of being the first and the fastest and I felt I was capable of beating the record." Mr Beaumont was met at the finish line by his mother Una, father Kevin and sisters, Heather and Hannah. His mother has been co-ordinating his trip - paving the way with embassies, arranging flights, dealing with the media, organising transport and making sure his bike was serviced. Mrs Beaumont said: "I am very proud of him. With Mark, the passion is being the first and the fastest. "It's about pushing himself to the limit." He has received messages of congratulation from Prince William and Olympic cyclist Chris Hoy. Guinness World Records spokeswoman Amarilis Espinoza said they were aware of Mr Beaumont's attempt. "We will be reviewing documentation from him and our researchers will go through the paperwork, but it has been logged as an official attempt and it seems everything is in order."